Background. The following material was extracted from MCCLL reports based on interviews, lessons and observations from operational units that participated in OIF/OEF over the past 36 months. Although this material is based on collections that took place in 2005 through 2007, comments from recent observers and currently deployed individuals indicate that issues on the ground likely remain the same. Content of this paper is grouped in response to specific questions in the TECOM tasking dated 2 April 2008. MCCLL reports cited in endnotes are provided separately on CD. Question 1. Interagency integration — any key lessons/experiences from OIF/OEF about working with civilian agencies? • A recurring theme was the U.S. military’s lead position in the conduct of stability, security, transition and reconstruction operations (SSTRO), in relation to Department of State (DoS), United States Agency for International Development (USAID) and other agencies involved. Despite a complex array of participants engaged in these activities as of March 2007, there appeared to be no one department, agency, or organization clearly in charge throughout the whole of Iraq, and the structure to coordinate SSTRO appeared to be some time away from becoming operational. • Personal relationships currently play a key role in interagency coordination, particularly where gaps exist in clear delineation and understanding of the chain of command, roles and resources. • It is important to improve unity of command, balancing economics and governance with security and stability operations, and assigning personnel with the appropriate skill sets, including language. • Subject matter experts in governance, economics, and agriculture are needed in all key areas of responsibility in order to effectively carry out SSTRO. Importantly, various DoD agencies such as the Business Transformation Agency are engaging in Iraq in order to provide subject matter experts in various fields. • Support from organizations outside of DoD is unpredictable, and units must be prepared to provide military support for SSTRO at the tactical level with little or no direct assistance from non–DoD organizations. • Integrated civilian and military efforts are key to successful stability operations. • Although interagency cooperation at the local and provincial levels may be adequate, a number of common sense refinements have been recommended. These include ensuring clear delineation of the chain of command, roles and relationships for USMC units supporting SSTRO in Iraq; continuing to develop structure and coordination between DoD, DoS and other non – DoD organizations through PRT and JROC type structures. • The United States Agency for International Development (USAID) is the key civilian agency building governance capacity and economic development in Iraq. However, at the time of this 2007 report, USAID has neither the manpower nor the funding to send a representative to every regimental or brigade combat team (RCT/BCT) in Iraq. • All three (3) Multi-National Force-West (MNF-W) RCT/BCT commanders emphasized the lack of key interagency representatives on their staffs and commented that at a minimum, DoS and USAID representatives with the correct skill sets needed to be assigned to them. • Seek out and recruit subject matter experts from the active duty and reserve components with experience in: oil industry, agriculture, transportation, civil engineering, micro – finance, economics, governance, trade, commerce, customs, immigration, rule of law, law enforcement, and related areas. • The current mission of the Provincial Reconstruction Teams (PRTs) is to enable the legitimacy of the Government of Afghanistan by facilitating provincial security, reconstruction and development, as well as to convince the insurgents that their cause is hopeless and to give up the fight in order to create enduring security and stability. 6 PRT operations will continue to be critical to success in counter-insurgency operations and are directly related to Marine Corps doctrine as defined by the Small Wars Manual and operational concept of Other Expeditionary Operations (OEO). This is a difficult mission and it needs to be executed effectively. There should be a skill designator established for PRT experience. • Cultural awareness at the macro and micro level are of equal importance and it is necessary to develop guidelines to accommodate cultural differences and avoid offensive and ineffective communication. Understanding the nuances of tribal leadership and inter-tribal relationships can be critical to successful interaction. Additional training is necessary at all levels and in some cases compromises that are uncomfortable to U.S. personnel may need to be made to ensure the successful accomplishment of the mission. • To be effective the PRT must be adequately staffed to support the PRT commander in his multiple responsibilities of engaging the local provincial government and Afghan population, supporting non-organic U.S. and nongovernmental agencies while simultaneously organizing, running, and sustaining a forward operating base. A majority of the service members assigned to the PRT are filling billets as individual augments, and it is important that all personnel assigned to a PRT are trained and prepared to handle the varied complexities of civil military operations. • It would be valuable for PRT commanders to have had prior experience with a PRT.8 Although a PRT needs to be task organized for its specific mission and circumstances, a straw-man table of organization model from which to build the PRT should be developed. • PRT command may be an excellent opportunity for officers who have been command screened as alternates. Furthermore, developing an experienced officer and NCO corps in civil military operations will benefit the Marine Corps in the execution of future PRT responsibilities in Afghanistan, Iraq, and future areas of operation. • At the time of the report, all the U.S. Army civil affairs personnel interviewed stressed the need to receive detailed training in negotiating, contract development, evaluating contractors, program funding and management, budget development, vetting and incorporating interpreters, and project turnover. • One important collateral activity is to identify and mentor key Afghan personnel in democratic governance and leadership. This should include efforts to reduce corruption at all levels. Question 2: Does the USMC have a way of recording best practices for what works well in the field in terms of interagency integration (or otherwise)? Following material is an extract from “Lessons Learned Integration Process,” a MCCLL prepared CMC congressional testimony paper, 1 April 2008. The Marine Corps Combat Development Command (MCCDC) oversees the Expeditionary Force Development System (EFDS) used to determine required capabilities that enable the Marine Corps to field combat ready forces. MCCDC uses a “universal need statement” or UNS process to foster an ‘integration environment’ that can smoothly and efficiently receive a capability need, conduct assessment of impact via the Capabilities Development Board to obtain decision from the Marine Requirements Oversight Committee (MROC), and procure/deliver the capability within short target timelines. Over four years ago, the Marine Corps stood up an organization known as the Marine Corps Center for Lessons Learned (MCCLL). The MCCLL interfaces with MCCDC’s EFDS process elements, resource managers, Training and Education Command (TECOM), Marine Corps Systems Command (MCSC) and other joint, services and agencies lessons learned organizations. MCCLL serves as one of the conduits of information from current operations in CENTCOM and other theaters. It is also a repository and a means of disseminating this information into the EFDS so that ‘lessons learned’ become ‘lessons acted upon’. Although the MCCLL analyzes lessons learned and makes ‘supportable’ recommendations, advocacy for working the issue resolution process, on behalf of the CMC and within the joint lessons learned community, is the responsibility of other organizations in the Marine Corps. Lessons and observations related to development of future capabilities are disseminated to decision makers, resource managers and agencies overseeing combat development processes. Briefings, information papers and reports are provided to TECOM, MCSC program managers, the Capabilities Development Board (CDB), advocates and others at HQMC, SecNav, and SecDef, and as input to Congressional testimony. Lessons and observations are also shared with other services, joint and Joint Forces Command “lessons learned” organizations, coalition partners and others. At the macro level, MCCLL provides an online knowledge management system with sophisticated searchable databases, topical forums, briefings, information papers and reports from ongoing operations. MCCLL also provides a classified Weekly TTP Rollup, a safety update and a monthly newsletter to our engaged forces. These products and processes have resulted in both materiel and non-materiel improvements for Marines. The MCCLL system was recently designated as the DoD system of record for lessons learned management. Redesignated as the Joint Lessons Learned Information System (JLLIS), it is being provided for use to all combatant commands, services and agencies staffs. The JLLIS integrates a Joint Lessons Learned Repository that provides for cross sharing of knowledge between the Joint, DoD, and interagency lessons learned / knowledge management communities. At the micro level, MCCLL has adopted an aggressive posture of integrating lessons into the operating forces, supporting establishment, training, education, investment decisions, and combat development through the use of liaison officers and proactive personal contacts across the DOTMLPF spectrum, as well as wide distribution of its products throughout the Marine Corps. 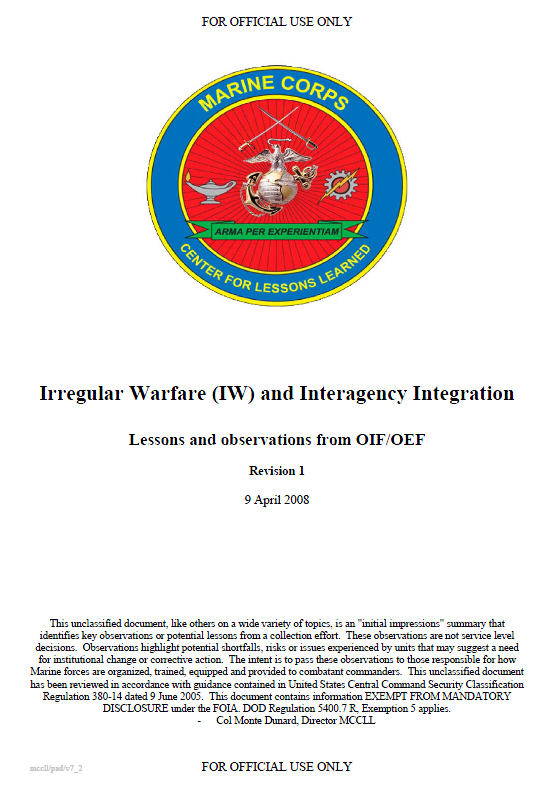 Summary: Lessons and observations from the operating forces that relate to irregular warfare and a wide array of other topics and functional areas are being documented and disseminated to appropriate Marine Corps advocates and proponents, in the interests of improving how Marine forces are organized, trained, equipped and provided to combatant commanders.